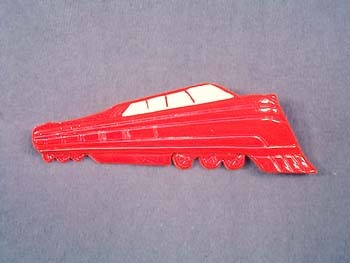 This great pin is styled like the big impressive streamline trains of yesteryear. Molded of glossy red plastic, this piece has nice detailing, with ivory enamel highlighting the windows. The pin is 3-3/4" long and 1-1/4" high at the front of the train. This magnificent pin is in near mint condition, with very minor crazing in the finish. We have been unable to determine the age of this pin, however it is old enough to have some light crazing in the finish as noted above.